Continue on to read the full patch notes from 2K Sports. Here are the fixes coming to Patch #5. The patch has been released on the Playstation 4. Coming soon to XBOX One, Nintendo Switch & PC. - Native 4K resolution at 60fps support added for the launch of the new Xbox One X console. - Player action photos have been updated to include the players in their new uniforms. - Custom created shoes are now a much higher resolution when viewed on players in-game. - Authenticity improvements to Clippers, Spurs, and Magic 2017-18 uniforms. - Authenticity improvements have been made to the ’07-’08 New Orleans Hornets uniforms. - Fixed an issue on XB1 where GameDVR was not working for some users. - Improvements to the audio ‘pops’ reported by Switch users. - Fixed an issue on the Switch where armpit hair was showing as white/grey on players that have it. - Addressed an issue in Play Now Online where the incorrect trophy was unlocking when advancing tiers. - Fixed an issue where the Coach’s Clipboard would show the incorrect matchup for an opponent. - Fixed an issue that allowed players to break out of a dunk and re-jump into another dunk after performing a drop step move. - Adjusted shooting foul frequency, especially for well positioned and high rated blockers. - Fixed an issue with the shot clock on the broadcast scoreboard where there would still be a very small amount of time after it reached 0. - All of the player icons should now be visible when reviewing the 3-2 Zone defensive set during a timeout. - The user’s suggested lineup will no longer revert after reaching a 90 overall and setting it in the My Minutes menu. - Fixed an issue where the VC balance shown at the end of NBA games wasn’t displaying the correct value (though you were actually credited with the correct amount to your account). - Fixed a hang that would occur when attempting to leave the MyCOURT closet with a custom-created shirt equipped. - Addressed an issue where the user was unable to equip the skateboard onto their MyPLAYER. - Addressed an issue where the user was unable to equip custom-created shoes onto their MyPLAYER. - The MyPLAYER’s headband will now properly colorize along with his teammates. - Fixed a case where the user would be unable to enter a Team Practice when they had previously decided to switch to a different shoe company after shooting their shoe commercial. - Fixed a rare hang where the game would fail to advance at the conclusion of the 3PT contest during All-Star Weekend. - The MyPLAYER’s headphones should no longer unequip unexpectedly when performing various actions in the Neighborhood. - The MyPLAYER’s accessories will no longer be seen unequipped during postgame interviews following played NBA games. - Fixed an issue where an incorrect Defensive FG% of 0.0% would occasionally be shown during halftime, causing your head coach to give inaccurate advice. - Addressed a case where the game could hang after the opposing team wins the Conference Championship in MyCAREER. - Fixed a number of issues surrounding the starting and ending of MyCOURT games involving other human users. - Corrected an issue where Bryan stopped texting the user regarding the picking up of earned endorsement checks. - Users of the Switch version of the game can now join other friends in the Neighborhood by using the Friends app on your in-game telephone. - Improvements to the T-Shirt Voting interface as well as the T-Shirt Purchasing interface. - Fixed a bug where some users weren’t able to complete the Gatorade endorsement after winning 5 games on the Playground. - Fixed an issue where thumbnails would fail to appear if the user moves between the T-Shirt Store and T-Shirt Voting pages too quickly. - Fixed an issue where the 2K Cam would fail to flip in Playground games when previously playing a King of the Court game. - Stability and performance improvements to the Dew NBA 3X event. - Addressed an issue where the timer wouldn’t always count down as expected during the Dew NBA 3X event. - Lineup improvements during Ruffles 4-Pointer Challenge games to ensure that similar positions guard each other where possible. - Fix a case where some users were unable to join a friend’s Playground due to their name being flagged as inappropriate. - A number of improvements to the Pro-Am Walk-On/Team experience. - The correct VC earnings and balance will now be shown at the end of Pro-Am games. 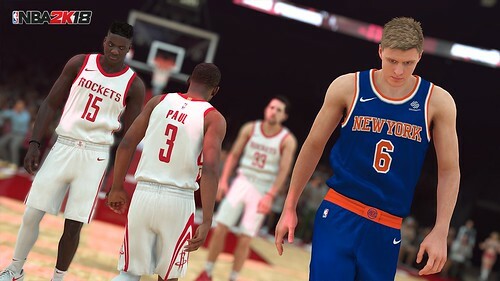 - Teams can now wear alternate jerseys in Pro-Am Team when they reach the Elite status. - Users who foul out in Pro-Am games are now able to spectate the remainder of the game. - Fixed an issue where users who had their commentary language set to Spanish were experiencing problems playing in Pro-Am games. - The end of game stats overlay will now appear with the correct stats for users who foul out of a Pro-Am Team game. - The 2K Card will now show the correct Pro-Am Walk-On stats. - Fixed an issue where players were being removed from online MyTEAM games for committing too many fouls when they had only committed a small handful. - Users can now apply any brand of shoes to historic players. - Setting up your lineups is now easier as player positions are now shown in the Edit Lineup interface. - The Total Points tally at the end of a MyTEAM game will now always display the correct amount. - Shoe boosts and added badges will no longer be incorrectly applied while in Pack and Playoffs. - Fixed an issue that caused premiere players to wait until the end of free agency before signing a near-minimum level contract. - Tuned the quality of draft classes at the default level to bring down some of the higher end prospects being generated. Ongoing work is taking place to improve this further and better balance the classes as a whole. - A number of improvements to the editing of contracts, including that users can now properly edit contracts of players who have signed a contract extension while still on their previous contract. - Fixed an issue where a valid Advanced Rotation would fail to load within the Rotation Timeline menu. - The System Proficiency and Player Training menus will now list players in their proper lineup ordering. - Fixed an issue where the portrait for the currently selected staff member would fail to draw after advancing days during the Staff Signing period of the offseason.